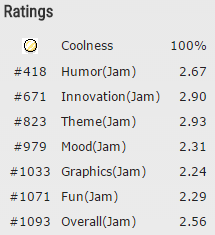 In other words, going by the ratings alone, it was pretty much my worst Ludum Dare entry ever. Ouch! Oh, and here goes that my worst-ever Ludum Dare entry, if you haven’t seen it yet and want to for some reason. Have fun, I guess? You should totally play these games! Having played 70+ entries I think I can tell about a few favourites. There they go. It not only features quite innovative mechanics, it also makes pretty great use of them, too. Has really sweet audiovisuals, charming story and neat puzzle mechanics. Quite hilarious take on chess and the best use of theme I’ve seen so far. Mind the Jam version has only 1 level, but the post-Jam one features a bunch more. It has soundtrack by DDRKirby. Also, nice metroidvania gameplay and great pixel-art graphics, but DDRKirby’s soundtrack is all the reason you need. Absolutely brilliant game by the best developer ever, it features clever mechanics, charming characters, hilarious descriptions, any music you like, ahahah… oh, who am I kidding. Well, more precisely, with a half-hearted attempt at it. It seems I’ve opened quite a can of worms when starting all that tutorial stuff. I’m afraid it’s necessary, though, since many people seemed rather confused by the gameplay. Dunno if, with the way I’ve set it up, there will be some improvement, or perhaps even more confusion? Won’t know without trying, anyway. I managed to make a somewhat self-contained game. That is, it has some objective (hoarding every possible item available in the machine) that can be reached (I made sure of that). Plus, as far as I know, mechanics are sound and don’t cause crashes. Not only that, there’s relatively much content to get, even if it uses mostly crude placeholders, or even generic placeholders (i.e. missing-in-action sprites). Given it’s not unusual for me to end up with more or less pretty half-finished core engine that doesn’t really work as a game (and even otherwise, I end up with little content), I can consider this a success. GameMaker’s HTML5 sorting (above) vs Windows (below); the HTML5 version makes lots of sense, but is not what I need, sorry. Either way, Sunday evening I kinda had a burnout and needed to procrastinate a little, and only then I came up with the idea of vending machine. Alright, full disclosure, I wanted to make a game involving vending machine giving random items for a while (and considered it for shapeshifting, as in turning inserted items into other items that would be then returned; that sort of processing). However, only at that time I actually realised what sort of mechanics I could use so that the vending machine actually works in a way that makes sense. Knowing that, the rest of game mechanics, the rooms to make etc. kinda came to me naturally (though I had to make sure that every returned item I could think of would be actually available). At that time, however, I’ve been already half the Jam behind, and I already had spent some time and energy on another project. 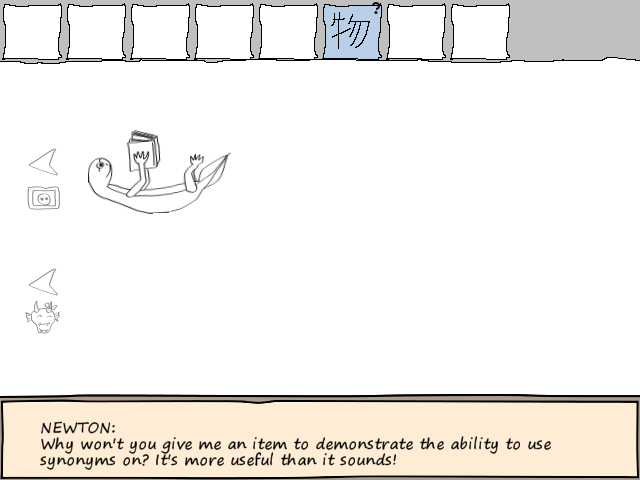 Due to lack of time, I couldn’t make proper menus, assets, display etc. In fact, it’s a miracle I even got the core mechanics working in the first place (and made Newton’s picture and floating motion, at that). But Alice, I don’t see what’s wrong with those graphics! Also, I guess I didn’t quite strike the right balance between the known and unknown. Generally, I intended the vending machine mechanics to be figured out by the player rather than explained, since having that known from the very beginning would leave out some joy of discovering it on one’s own. I still believe it shouldn’t be provided straight, but I guess there wasn’t enough indication about what’s going on in there. 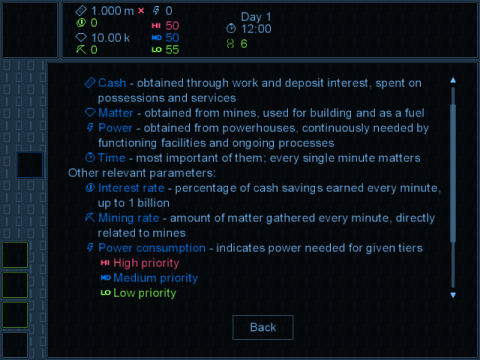 The most recent post-Jam version hopefully fixes it at least a bit, as it introduces a bunch of indicators of not-quite-known purposes that reflect some part of machine’s internal state. Then again, some people might not even reach the point where they get FUN, which would imply they haven’t even realised the basics of the gameplay. I might include a “tutorial” of sorts in one of post-Jam updates, which should make the core gameplay clearer… I hope? Furthermore, when I was playing a game just after LD, I found the gameplay kinda too slow; especially due to frequent switching between Newton’s and machine’s room (and I didn’t even visisted hoard that often). With that in mind, I reduced the transition time a bit. 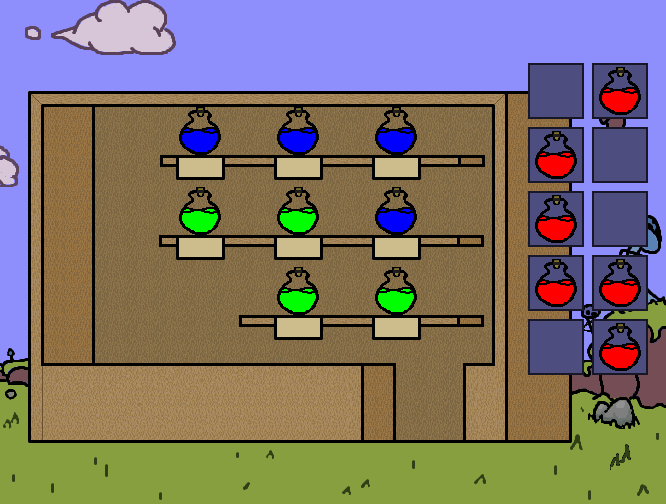 Also, according to some helpful comment I made it so that selecting a synonym in Newton’s room makes the item collectible, and added buttons for quick switches. 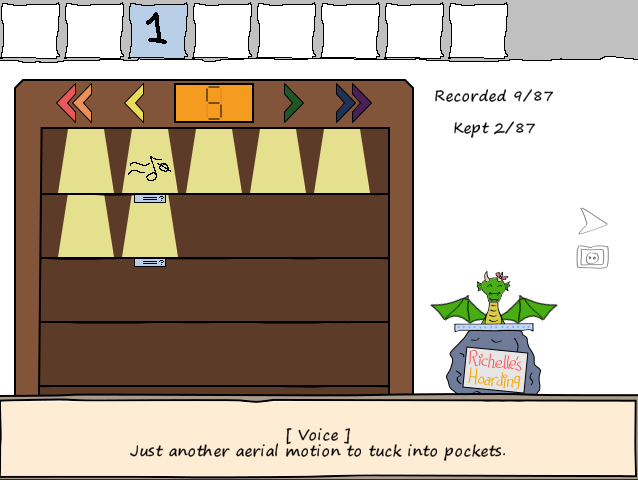 Kinda against that speeding-up, I added some little animation to inserting and receiving items from machine. I hope it won’t make the game too sluggish. ^^’ The lack of game saving doesn’t really help, either; it seems that sort of gameplay encourages a few relaxed, casual sessions rather than discovering everything in one go (even less so when I add more items). Finally, I forgot to include randomize() call at the beginning (GameMaker, pls, who in their right mind wants RNG with preset seed?! ^^’), so the vending machine items queue always starts the same. And that’s terrible. Thankfully, that gross oversight on my part has been fixed in the most recent version. If it wasn’t clear enough from earlier part of the post-mortem, I’m still working on the post-Jam version, making updates every two days or so. Since I kinda neglected the polish in the Jam version, the changes so far involve prettifying the game, without really changing the core mechanics. Maybe that’s because I find graphics/UI to be usually the more difficult part and want them out of the way, or maybe I’d just like to see more than a bare skeleton…? So, I participated in the recent Ludum Dare, took 3 days to work on the Jam game, so of course the next logical step would be to start playing other games, maybe further tinkering with own entry, that sort of thing? Nonetheless, I’ve managed to shell out a few hours to spend on further development, even if I’ve still got a long way to go. Behold, a prettily formatted and scrolled text! If you’d like to play around with the current version, it can be found here (the recent changes can be found under “Post-Jam” category, of course). I won’t blame you if you won’t; it’s still very unfinished. Sadly, it seems I won’t be participating this time around. 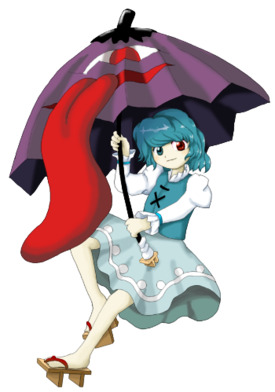 I got kinda overwhelmed by the LD game and, more importantly, I’ve found myself longing to do other project of mine instead; and if I were to choose between doing another project or procrastinating while trying to make LD game, I’d rather pick the former. It’s not even “I feel like my game won’t be good enough”, I wouldn’t drop out for such a silly reason. Rather, I feel like I can’t bring myself to work on that project anymore; not today, at least. Still, I do plan to stay cool (not too hard during winter, huh?) even if I won’t have a game to attract the attention to. After all, I’ve got player’s theme bingo to play~! It’s a follow-up to my plea related to this game. Seriously, do check that game, and if you’re somewhere crowded, feel free to do some exploration (I am in Greenland myself, but apparently it’s not green). I heard there is interesting stuff in Amazon, China or India. I am likely to reward brave explorers with comments on their games (although I tend to be harsh, it seems ^^”). 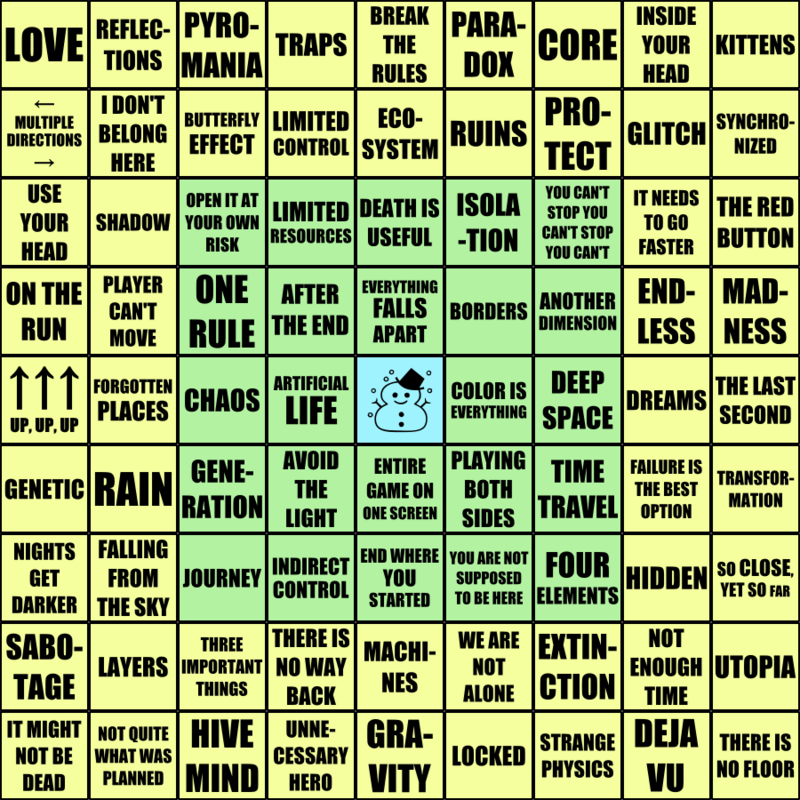 Theme Bingo ~ Let the madness begin! 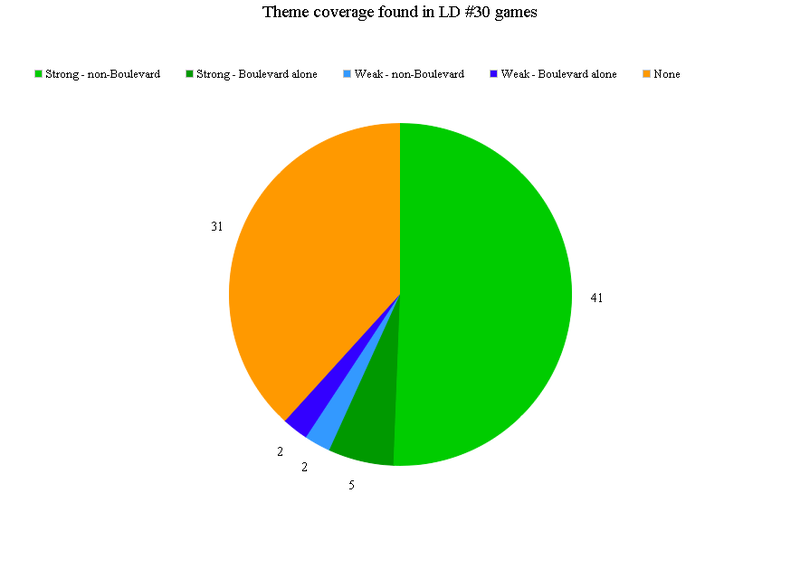 It's worth noting that themes that have strong coverage found are bolded, while themes with weak or no coverage found aren’t (no coverage can be recognised by lack of linked games). I decide whether coverage is weak or strong arbitrarily, but there’s some measure decisive in most cases: if theme usage needs explanation, it means that it’s probably weak. 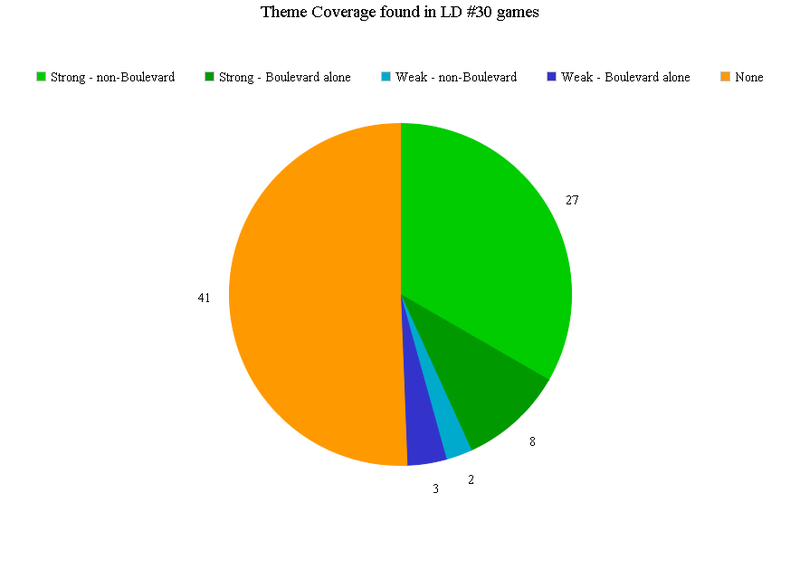 Also, if there’s at least one game with strong coverage found, the ones with weak coverage won’t be linked. 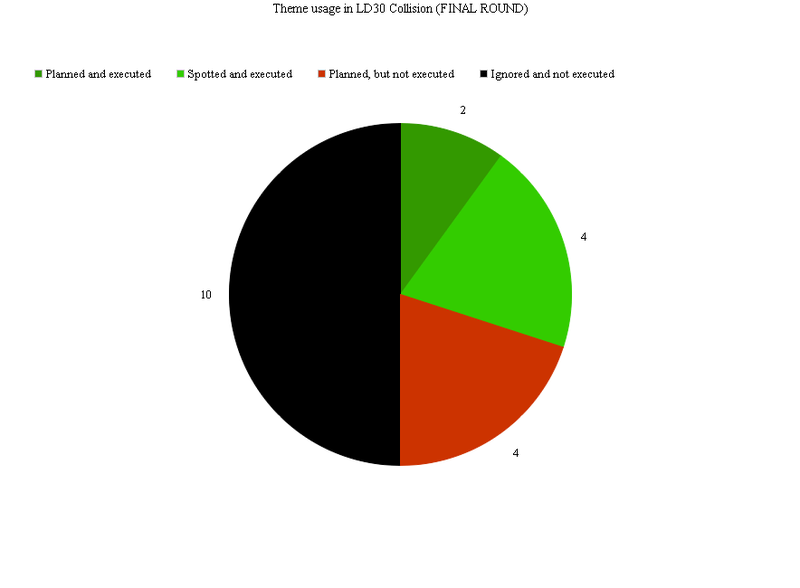 Additionally, if there are many games that cover the given theme strongly, only the most noteworthy will be picked. Also, I don’t include my game in the list, since I want to be a good girl and do my best to break the habit of shamelessly linking it. Coverage found so far: 17 strong, 2 weak, 62 missing. Since people seem to post fancy statistics recently, I decided to make some of my own, too. However, I don’t really have an easy access to LD data nor a friendly bot to retrieve these for me, so instead I came back to some idea I had some time ago, but eventually forgot. Have I mentioned Connecting LD30 to the Real World? No? Well then, now I mention it. 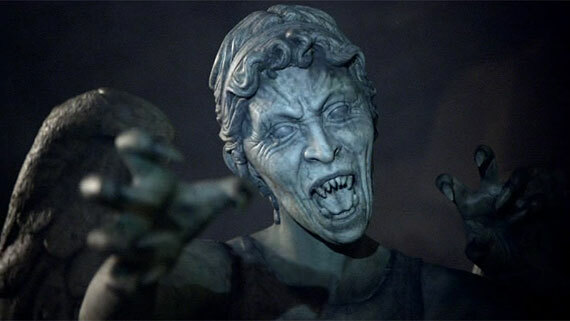 Actually, I did mention it before, but it won’t hurt to mention it again. 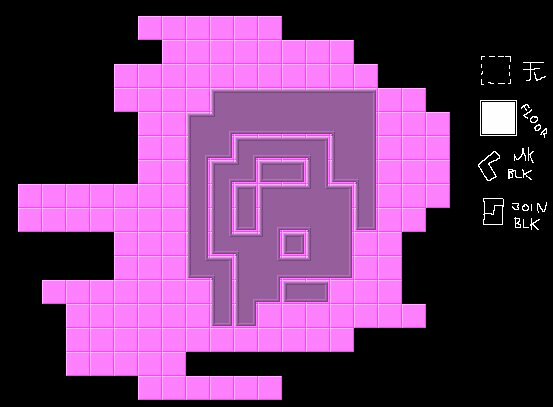 That’s because I’m running out of entries that would allow me to reveal significant portions of map, while there’s a huge, huge space that’s yet to be discovered. And that’s terrible! As you can see, there are large, large areas yet to be discovered. 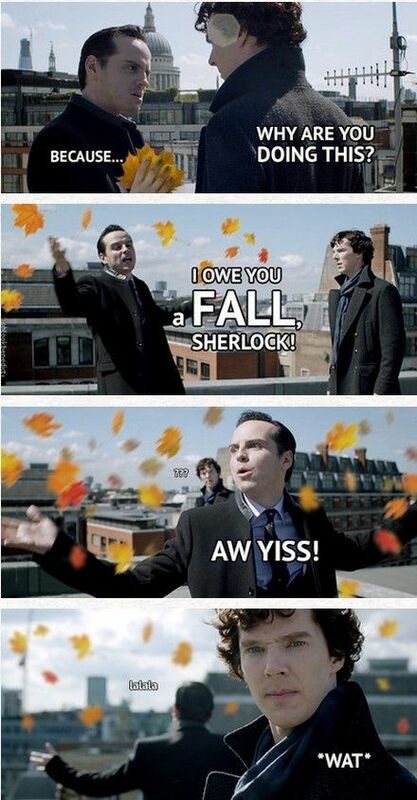 And that’s what I would like you people to do. To discover, so that we could reveal as much of the amazing map Will Edwards prepared for us as possible. I already moved to Greenland, but I can’t do this alone. I need your help. Let’s conquer the world together! Phew… having played 100 entries (which is less than 4% overall…) I think I can now mention a few I found particularly entertaining; note that I don’t really take the theme into account giving these recommendations, and one of these games weren’t scored at all, since I played its much more polished version from a few days later. As you may notice from these entries, I’m quite a fan of story-driven games. Since arranging these games in fun factor order would be too big of a task to me, I’ll just list them alphabetically. Crece-above-Clouds – interesting tower-defense game, though you might want to take a look at the second screenshot where instuctions are (couldn’t see the instructions ingame; maybe I didn’t look hard enough) to have any idea what to do. Liked the internal dialogue, waiting for story mode. Alright, having played some other games a little, I think I can write that thing somewhat menacingly called “post mortem”. 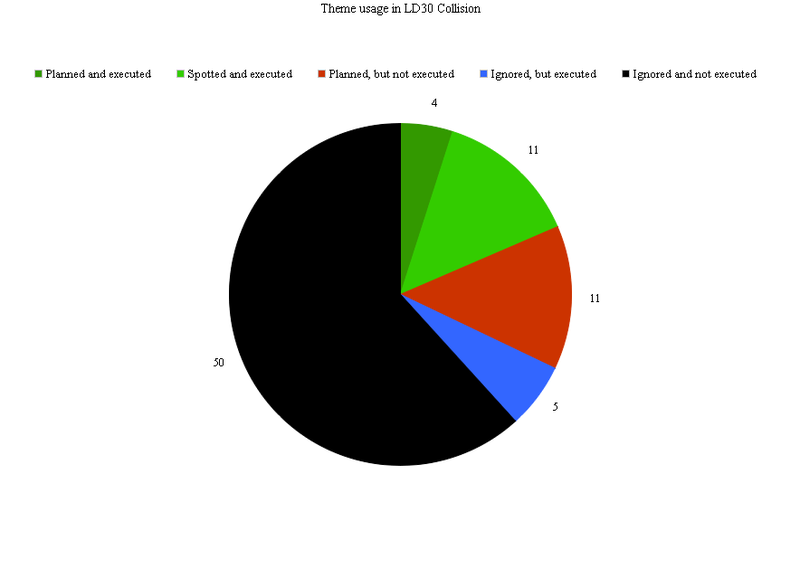 For the reference, the game I made was Collision. The tools I used were GameMaker: Studio for general engine (along with earlier declared PARADIGMOSIS framework in progress thing), OpenMPT for soundtrack and Audacity for OGG conversion, SFXR for sound effects (I admit, it really *is* an awesome tool, especially in such short jams). It was for the 48 hours competition, but in the end I feel it ended up better than my earlier games for other 72-hours competitions.